Sit and iron in comfort with the Miele rotary iron. 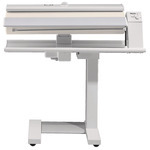 This easy-to-use appliance has a wide roller that allows you to press everything from shirts and pants to bed linens and tablecloths, all with a crisp, professional finish. The electronically controlled roller speed can be adjusted to suit the type of laundry being pressed, and your own individual working speed. It is operated through the use of a foot pedal, allowing you to sit while you iron. The Miele rotary iron has maneuverable rollers for quick and effortless transportation, and folds away neatly for easy storage.